Midfielder Sammy Clingan has penned a new one-year deal with Danske Bank Premiership side Glenavon. The 34-year-old stays at Mourneview Park for another campaign, quashing rumours suggesting he was headed for the exit door. 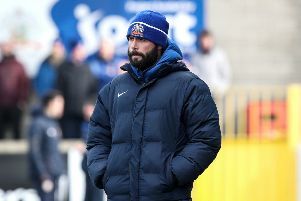 Clingan, who has 39 international caps for Northern Ireland, moved to the Lugan Blues from Linfield last summer. Last year he proved to be a central figure for Gary Hamilton's men, netting 12 goals and helping them finish third in the table. “Sammy was brilliant for us last season, not just on the pitch – we all know his ability and the talent he has and what he brought to the team – but more so as well, off the pitch, his professionalism, the example he set for the younger players, the way he goes about his business, his attitude in training and everything he does,” a delighted Hamilton told the club's official website.